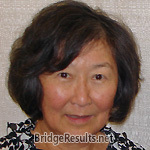 Jerry Astrove and Carol Abramowitz scored 0.56 masterpoints with a 58.98% game at La Jolla Beach and Tennis Bridge Club. See full results of this game. Kevin Chaisson and Ginger Calvert scored 0.73 masterpoints with a 55.45% game at La Jolla Beach and Tennis Bridge Club. See full results of this game. David White and Pat Larin scored 0.50 masterpoints with a ★65%★ game at Joshua Tree Bridge Club. See full results of this game. David White and Pat Larin scored 0.70 masterpoints with a ★63.54%★ game at Joshua Tree Bridge Club. See full results of this game. Carol Abramowitz and Jerry Astrove scored 0.68 masterpoints with a 55.94% game at La Jolla Beach and Tennis Bridge Club. See full results of this game. Deanna Ruttenberg and Tatsumi Mercer scored 0.37 masterpoints with a 53.84% game at La Jolla Beach and Tennis Bridge Club. See full results of this game. 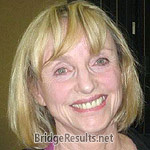 Carol Abramowitz and Jerry Astrove scored 0.24 masterpoints with a 50.46% game at La Jolla Beach and Tennis Bridge Club. See full results of this game.